Just got done brushing up the website a little today -- you may notice a few changes. The old commuting articles have their own links now, which should prove handy -- so if you are looking for information on how to get started out riding to work, and how to debunk some common commuter excuses and myths, check em out! You also can ALWAYS email me for commuter questions, or how to find a good route in this suburban maze of KC. Banner link available on the right. Also, the rotating "on-the-cover" photo section has been retired... mainly as a time-saver, and 2ndly as a consistency measure. You'll have the same banner everytime you visit, so there's no question about whether or not you're in the right place. I simply started running out of photos to post, and I had to got steal one from Noah's webpage just to get by ... then I realized, yeah, A) I'm digging in the photographic past and retelling old tales too much, and B) if I happen to come across a good photo, I'll just put it in a post for ya. That way I don't have to keep figuring out which font color is going to be visible on which photo background at the beginning of every month, too. I know, I know - I should have so much to complain about! Photos will all be logged on a Picasa web-album now, and will be slide-showed at the top right from now on, as a sorta "replacement" to the old "front page" pics -- click on the photos and you can browse thru a lot of random cycling pics... and some just plain random pics. 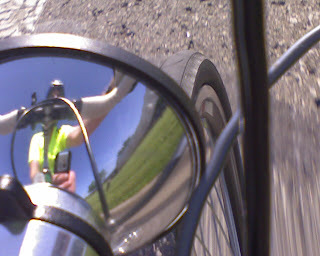 The photo I chose was the first photo EVER put on the old CommuterDude.com page, and then ended up being the background image for that site from 2003 thru late 2007 when I took it down and went "all-Blogger". It seemed appropriate - this is a shot from the 2003 KCUC 300K up north of liberty - and oddly enough it's a wrong turn, so I've only ever seen this road once. It's MO Hwy "E", way up in .... well, I don't remember. We turned around about a mile later after realizing the mistake. In green is me, right next to the Warbird in red/white, and just up the road is AW and daughter on their tandem. Photo courtesy W0DEW. I love that picture. It stays. I also added back in a little welcome banner with the old webpage logos -- a little props to the old FTP-updated HTML page, eh? I really dig this blogger engine'd deal - really easy to maintain and update, and the price is right on. Plus, all I have to do is keep the domain paid up, and we can roll this puppy on the cheap -- good stuff. So, whether you've gotten used to the "commuterdude.blogspot.com" address, or like the old http://www.commuterdude.com/ URL, either one will work from now on. Now, on to todays commute and photos! Today dawned bright and cheery, with a calm breeze from the south and cool temps in the 60's. A great morning for a bike ride. It's hard to fathom, but the temp would swing up 30 full degrees by the time I'd leave work. Kinda nutty for around here. The other thing I've noticed, the sun is a LOT more brutal this year than in years past. With the low humidity, especially, it seems like I'm riding under a heat lamp. Either that, or my tolerance for UV is dropping each year. I already invested in two good hats this year, for off-bike outdoor activities, like mowing the grass. Earlier this year I got a nasty sunburn on my head, and today - after forgetting my hat on an afternoon walk - I have another, more minor, burn that I can feel. Ugh. 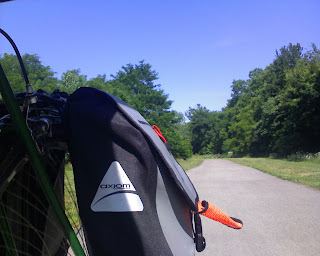 Thankfully, the majority of my ride is on the tree-lined bike trails, and I never ride without a helmet - or some sort of head cover underneath it, also. Perhaps it's just exposure, but my head hurts and it warm to the touch. Ugh. Engage dome-cover, moron! Took a couple of pictures, trying to spice up the content in here. While I probably won't take as many pics as most, it might help fill in the gaps between longer ride reports. Rushing along the shady bike trail in the 90-degree heat - glare is becoming a problem lately. 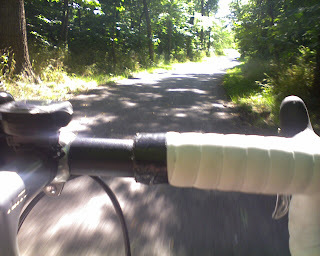 Even this morning it was a squint-fest, as I forgot to don the cycling cap again. No near-misses, but dang it's hard to see! Time to wake up earlier! A little risky trying to line it up... but a nice reflection in the housing of the Schmidt headlight. Too bad I couldn't get my pretty, pretty mug in the frame. Ho, ho, ho. Look, ma! Safety yellow jersey! 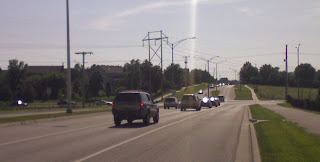 143rd and Pflumm, another one of those popular south-Overland Park, almost Olathe, intersections that for the LIFE of me I can't figure out why it isn't a fully controlled traffic-lighted intersection yet. The Afternoon Kill-Zone isn't looking too bad today, actually, as I prepare to merge left for another dastardly manuever. In a few short seconds I'd come face to face with a mini-van driver that didn't turn his head or really even stop fully. Nice. Note the nice "side path" that only serves to make matter worse. Don't believe the hype -- take the lane, and sprint like your life depends on it. It probably does anyways. You know, I spun that off kinda badly --- in two years of traversing this intersection, todays mini-van showdown was the closest thing even approaching a "close-call", and we didn't even have to exchange hand signals. It could always be worse... just make sure they SEE YOU! 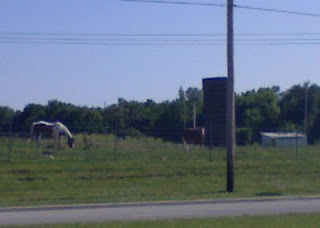 One of the things I happen to LIKE about the intersection of 143rd and Pflumm, is the Hilltop Stables. A place that one day I'm sure will probably move, but hads thus-far been here "forever". Two nice looking mares out for a sun and a grass-eating session pause to review me as I stop for a photo, and they let go with a nice loud "whinney" (the one by the silo, hard to see but you can see the white accent in his nose). Pretty cool, considering I only had to turn my head 45 degrees to see it -- right after snapping the picture above. It's nice to have little reminders of what this area was all about only a decade ago. The rest of the ride home was a battle royale with the headwind, but a nice workout, and a great end to a decent day.